The components I am talking about are the Unison integrated amplifier Model Simply Italy and the Bryston Model Mini T loudspeakers. The amplifier came in for a short audition — and it had been burned in and was ready to connect to a pair of speakers I had in-house at the time — my own Ethera Vitaes and Bryston's Mini Ts. My main interest is high-end, not because I like high priced equipment, but because this is where — more often than not — high performance is predicated. However, I am also of the opinion that a well organized/chosen system can and will render above average musical performance in the much lower price ranges, The above-mentioned components represent a good example of a medium-priced audio system with which I can be happy. First, I'd like to direct your attention at the heart and soul of the system — the amp/preamp — the Simply Italy integrated amplifier. It was designed by Professor Gianni Sacchetti and engineered to the same standards as its bigger brothers. Despite all this, it costs the same as a decent conventional transistor amp. On paper then, a highly tempting proposition. The Simply Italy is a single-ended ultra-linear Class A design that produces but 12 watts per channel. 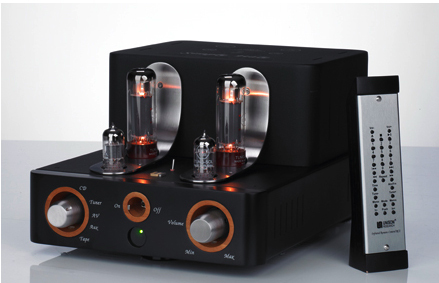 It employs EL34 tubes in the output stage and ECC82 tubes in the preamp and driver stages, most likely the topology that renders the amp's remarkable ability to produce (or reproduce) wide imaging, clarity and musicality. Look at the amp, it looks Italian, feels Italian, and is outright cute. The two knobs are for volume and source selection on the unit's front panel. That's minimalistic, with no frills — other than its remote control — a wooden one at that. It sports four high-level inputs (no phono section) and an on/off switch. A chrome cage protects little sticky finger from burning and the four tubes from damage. The wood accents on the front panel lend the unit a smooth look and harmonizes well with the distinguishing circular inserts for the two controls. Two satin stainless-steel bands below the tubes assist the thermal isolation of the electronic circuit and output transformers. There is an infra-red remote control for the microchip control circuit; it manages control of analog volume via an RK27 series ALPS motorized potentiometer. Four large gold-plated speaker terminals allow any type of cable connection; the control knobs are turned from non-magnetic stainless-steel with a sufficient diameter and weight to provide a smooth flywheel effect with excellent feel and rotational precision. While the wooden parts are important for the aesthetic design they also play an important role in damping chassis resonance. The amplifier is designed and developed in Unison's facilities. One of their design features is an adjustment of the output impedance from 8 ohms to 6 ohms to provide compatibility with a greater range of loudspeakers — those in the 4 and 8 ohm range. The size of the unit doesn't allow a true dual-mono configuration, but Unison designed a power supply which might be called “Quasi-Dual-Mono.” In this configuration, the power transformer and first filter stage and the power supply are doubled, separating all preamp stages to achieve low crosstalk and low distortion. Unlike many manufacturers of amplifiers, Unison Research design and manufactures their own output transformers which assists them to create an output stage that consisting of one EL34 in a single-ended ultra-linear configuration. This mode of operation for the output transformers allows the pentode EL34s to operate almost as if they were triodes.. A toggle switch on the top of the chassis, allows adjustment of the amount of negative feedback in the circuit, thus letting its owner tailor the sound for specific types of music, or specific tastes. As I checked the amp's power — only about 12 watts/channel — I was a bit doubtful about it handling loudspeakers with an efficiency rating of 89dB. Nevertheless, I gave it a shot (or two). 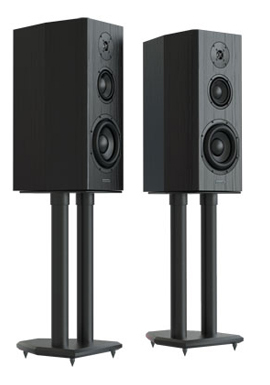 I began my listening test with my own Ethera loudspeakers — 8 ohms 89dB efficiency. Well, this worked out rather well and I drove them with ease to levels exceeding 94dB peaks. While this is not concert-hall fortissimo, there was enough sound to fill my listening room and have my wife asking to "turn it down". Good, so far. . . Next up. the Bryston Mini Ts. I threw some large orchestration at this system combination — Beethoven, Tchaikovsky, Wagner, etc. The amp handled it — the soft pianissimos and the inevitable crescendos — right up to 96dB. Then I put the amp to the test with my favourite jazz performers — Jimmy Smith on the Hammond B3, Coltrane, Ray Brown, Sonny Rollins , and the Italian responded brilliantly and effortlessly. Female and male vocals too, were clear and with surprisingly good timbre and harmonics, matching the performance of much more expensive separates. Why did it work so well? Likely because both sets of speakers maintain relatively stable impedance. My Bryston Media player as well as my Elite transport/Bryston DAC served as source components, wiring with XLO and Nordost in the higher end and BIS and Argentum in the lower end of cables (not mixed but separately) because I wanted to hear if cables influence the overall sonic presentation — they did, thus indicating that upgrading (read tweaking) is easy whenever the wallet becomes too full to carry around and the audio bug keeps nagging . In fact, this system responds beautifully to upgrades such as premium power cords, more expensive speaker cables, interconnects, Sort Kones. Black Raviolis and source components — every tweak is audible except the snake-oil type, of course . As I mentioned somewhere else, I — spoiled like few others — could/can live with this system without nervously aching for "better" sound. This means the system provides truly high-end musicality — never fatiguing and always pleasing the music lover in me. Just add speaker cables and a source component — and you should be able to get a whole system for around $10k. Bottom line — this isn't just an Italian, it's a hot Sicilian. Now that I have been listening to a relatively inexpensive system based on a $2500 amplifier and a $2600 pair of speakers, I have to admit that a good portion of the performance is quite in line with the sound/musicality of those components with the right stuff. Once warmed up, the sound is hot. It boasts the free-breathing quality that is the essence of the real good/expensive systems and the very antithesis of systems costing three times as much. The only shortcoming I noticed was that you can't get 120dB of sound-pressure levels. This is, of course, meaningless when the system is operated in today's rather small living rooms or listening dens. However, it never gets rough around the edges, stays musically correct at impressive volumes (see above) and delivers most of the elements one may expect from high-end goodies. This system is one great example of a successful system assembly in which synergy meets musicality — an introduction to high-performance audio at a reasonable price.